I’d never seen The Last Samurai before watching it for the blog, and yet I feel like I’ve seen it a few times before. That’s because this is your standard “foreigner embraces the strangeness of a new land” tale, à la Out of Africa, Dances With Wolves, Australia, Avatar, Lawrence of Arabia… need I go on? While The Last Samurai falls into the “white savior/going native” genre of film, it’s actually one of the better ones. The story is well written and actually treats the Japanese culture with respect. There is a great deal of attention to detail in the customs, clothing, and language shown here. It’s also worth mentioning that this film made more money in Japan than in the US, receiving generally positive reviews from their critics. So what this movie gets right, it really gets right. Where The Last Samurai really succeeds is in its cast. I’m not that excited about Tom Cruise’s performance, though I’ll admit it is solid. The real stand out for me is Ken Watanabe playing the leader of the samurai rebellion. Watanabe is always excellent, and this role is no exception. I only wish more screen time was devoted to him, and less to Cruise. The Last Samurai is a good film, it just doesn’t capture my attention as much as I thought it would. People have raved about this one for so long that I think my expectations were set a little too high. Though stunningly gorgeous, it still has issues that keep it from being truly great. So this is basically Dances With Wolves or Avatar, but with samurai instead of Indians or giant blue cat people. I am fully aware that Hollywood has a habit of recycling their stories, so I can deal with that aspect. The fact that Tom Cruise is one of the few remaining proper movie stars running around adds to its credibility. While the story is similar to ones we have seen before, I did like the original take of putting an American in the land of the samurai and have him be accepted into their world. The Last Samurai is different enough from the movies I mentioned earlier to still be entertaining. Cruise plays Nathan Algren, a soldier in the Indian wars of the late 1800s. He has been left traumatised and an alcoholic after carrying out the brutal orders of his superiors to slaughter American Indians. He is asked to travel to Japan to train their soldiers how to use new weapons like rifles and howitzer guns. The traditionally minded Japanese are reluctant to adapt to this new state of the art technology, especially their emperor. There is a rebellion beginning from some of the samurai who refuse to accept these changing times. They attack the soldiers before Algren is able to fully prepare his men, and they are slaughtered. Algren is taken prisoner because he refuses an honourable death. Eventually the American is accepted by the group of samurai rebels, particularly their leader (Ken Watanabe) and Algren realises he may have been on the wrong side, just as he was when he slaughtered all of those Indians years before. He wants to use his time with the samurai to make up for his past sins and possibly retrieve some of his lost honour in the process. The Last Samurai is a really good film. Although we joke about it being the same as Dances With Wolves (which it is) there are enough differences here to still be an engaging story. Some of it did not make sense, though. 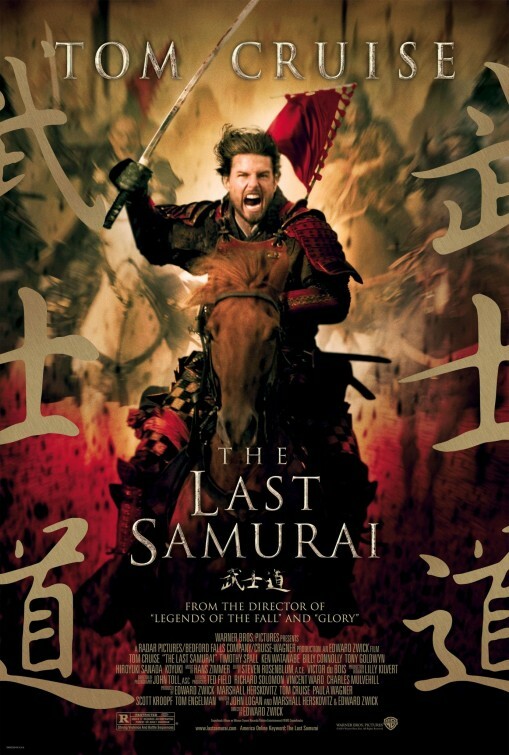 Tom Cruise’s character sure picked up the way of the samurai quickly. I doubt he would be besting men who had been training their whole life after he had been doing it for a few months. There are little things like that which irked me a bit, but not enough to ruin the movie. Cruise is terrific as the jaded American soldier and his scenes with Ken Watanabe are really strong. They have terrific chemistry together. I would have liked to see more from the fight scenes, but it is to be expected when one army has gatling guns and the other samurai swords. It is not really a fair fight. The Last Samurai takes a tried and true “fish out of water” story and tweaks it just enough to be entertaining.